I have seen several similar pages for artillery casualties, up to at least page 32, and all for 1914.. but like you am none the wiser as the source.. but perhaps an end-of-year report? I have yet to find a page relating to 1915 casualties.. There were some quite well printed versions of hospital admissions lists in a slightly different format which may have a similar or related source, i wonder [also attached]? But having only been collecting pages with artillery casualties I may well have missed an all-important front page.. Some [lefthand] pages also have a 'Part 1' in a top header .. Thanks for posting battiscombe, the first image is of very a similar format but alas still a mystery. Were these documents also found in WO 363/364? From what you say it sounds as if these are 'floating' sheets. These are reused scraps of paper used as memos in an individuals 363/364 file. If you check the fmp transcription rather than the images you should see whose file it's in and see it in the context it was used. Not uncommon to find identical lists in 2 different files. Fmp usually index all those on the list so a search on those names should lead you back to the same sheet. If a following sheet exists it would be in another set of records but only searchable by the names on the sheet. Frustrating I know but sometimes these lists turn up with a name only, the sheet being torn in half and numbers missing. I can see now that your sheet is in the WO363 series for 7959 Thomas James Donaghey, Army Ordnance Corps. I think FMP have scanned it twice but it's a scrap that's been reused as a memo regarding a refusal of his pension. No previous or continuation sheets in his file. Interesting that it's printed rather than typed up and that most of the entries are for 'Missing' with only a few wounded and one sick. Unlikey then to be a Hospital or other medical type list. It may have been a precursor to the official lists as sent to The Times although the one 'sick' would not apply. 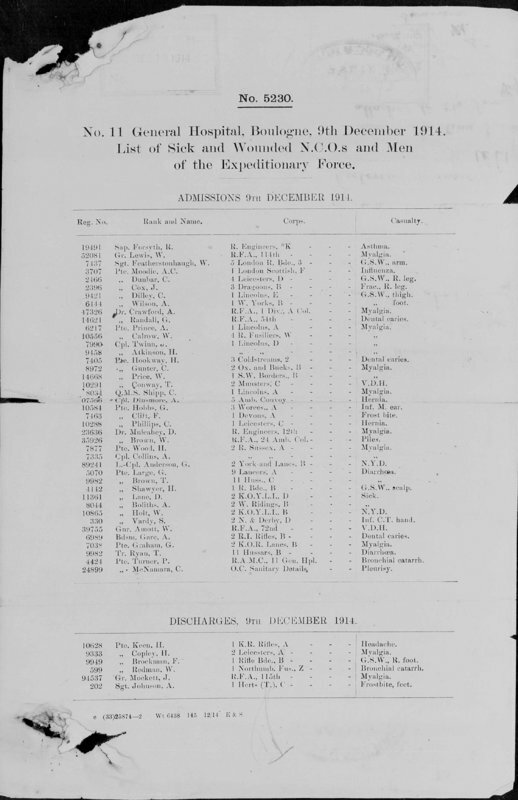 As most of the entries are for 2/Life Guards wounded, killed or missing 19/10/1914 finding other 2/Life Guards K W or M on same date that are not on page 2 of the list (via WO official Casualty Lists or unit diary) it may be possible to find pages 1, 3 etc among FMP records. If you want to find them that much!! 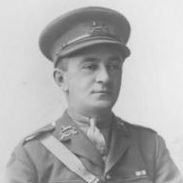 The document has been of great use in my current research of the 3rd Calvary Bde on 19th October 1914 and to find the RHG, 1st LG, 1st DG and 10th H entries.... not quite icing on the cake but sweet none the less. Like I mentioned I do have a list of names from the above units so a further search may prove fruitful. I found some other FMP pages which may be of interest. Yes, I set up a FMP search for just WO363/364. Then added 2nd Life Guards in the Regiment box. That should give you 972 results. I look for entries that are missing the Birth Year and Birth County as that usually means it's not a full set of records. EG 1st hit for Byron leads to the page 13 in my previous post. 2nd Hit will be his service records. You may also find lists of promotions, rates of pay, awards, punishments, POWs, Courts of Enquiry. Still not sure what the origin is for these printed lists. The information in your page 2 list obvioulsy stems from OC unit but at what stage the list was printed up I'm not sure although I feel being printed up in the UK seems more likely. No guarantee that the pages here; 2, 13 & 32 are from the same finished article. Dates are all Oct/Nov 1914. 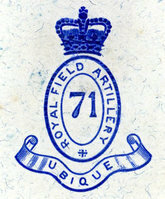 Incidently, Trooper Sainsbury 5512 shows up in WO Official Lists 11/1/1915 along with a few others from page 2. Including 4636 Barnfather 'under date Nov 23rd' ie the date the report was received.